Beautiful high fashion 100% genuine leather is soft, supple and durable. This leather dog collar is accented with black hardware. The shine and shimmer creates the character of bling without using rhinestones. # 6366 is 1/2 inch wide and available in lengths of 10, 12 and 14 is $9.99. # 6367 is 3/4 inch wide and available in lengths of 16 18 and 20 is $11.99. #6368 is 1 inch wide and available in lengths of 22 24 and 26 is $14.99. 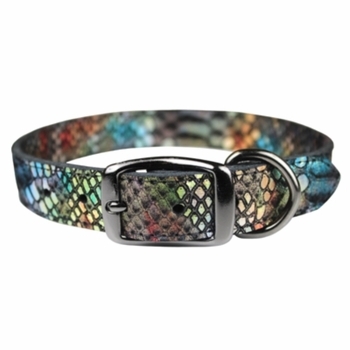 This leather collar is available in colors Cheetah, Turquoise, White, Multi Color, Bronze, Red, Silver and Rose Gold.